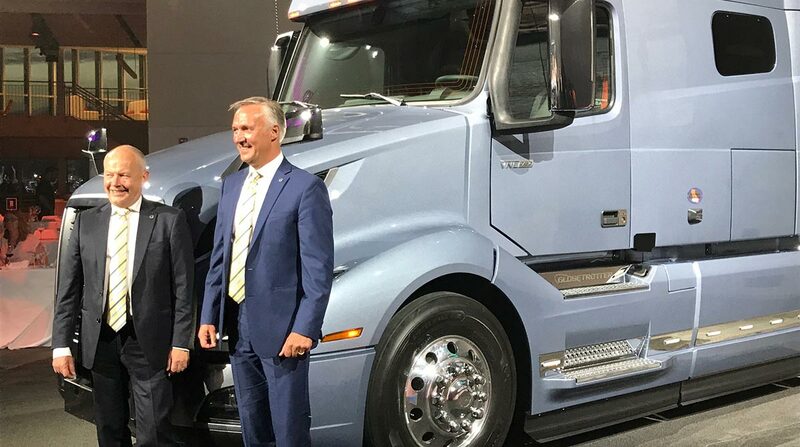 DUBLIN, Va. — The leaders of Volvo Trucks’ global and North American operations expressed optimism about the second half of this year and into 2018 during presentations for the launch of the company’s new VNL longhaul tractor. “We believe this market has bottomed out, and we see upward pressure,” Volvo Trucks Global President Claes Nilsson, said about the North American market. Goran Nyberg, president of Volvo Trucks North America, added that a rebounding manufacturing sector will help lift sales going forward, though he acknowledged that the company is struggling with a high inventory-to-sales ratio. “We believe that second half of 2017 will be stronger and expect that to carry into 2018,” he said. VTNA is based in Greensboro, N.C., and the global operation is based in Gothenburg, Sweden. Nilsson said that while 2017 is the third consecutive year of declining volumes overall, orders through April for the new VNR regional haul tractor are already outpacing full-year 2016 orders for the VNM model it replaces. He said that the United States is by far the manufacturer’s largest market; other key markets include Germany, the United Kingdom, France and Brazil. Nyberg said that the shifting scope of retail dynamics is providing a lift to the North American regional-haul market. “There is more e-commerce and next-day delivery to customers as opposed to stores,” he said. He also said that strength in the construction industry is helping the regional-haul sector. “It is a good time to be in the construction business,” Nyberg said. Not so for natural gas-powered trucks, however, he said. “Natural gas, it is no surprise, is going sideways, and we expect it to continue to go sideways due to the prices for diesel,” he said. The U.S. retail price of diesel, trucking’s main fuel, has been below $2.60 a gallon throughout 2017, the Department of Energy’s Energy Information Administration said. Diesel last cleared $3 a gallon Jan. 12, 2015, when it was $3.053 a gallon. Nilsson said the company’s service and aftermarket businesses have “grown very successfully over the last few years” thanks to the growth of Volvo’s captive engines and transmissions. “That is a much healthier business than it was a few years ago,” he said. Volvo’s dealer network also is healthier, according to Nyberg, who said since 2010 North American dealers have invested more than $600 million in their stores. VTNA dealers now number 420 “and counting,” he said, including 65 that have opened since 2010.